remake the culture along God-pleasing lines. and they need the support of their fellow believers." 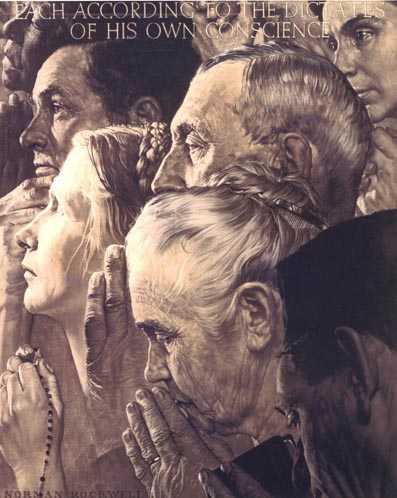 Click on the image to visit the Norman Rockwell Museum web site. Fashionable art critics once had nothing but disdain for Norman Rockwell, labeling his idealized view of America as "Gee-Gosh-Shucksism." But Rockwell's work is enjoying a resurgence of respect; critics like him again—and even "admit it in polite society"
Art is becoming either so esoteric as to be irrelevant or so commercial as to be reduced to a consumer commodity. Can we recover the foundation for true aesthetics? Contemporary Christian artists, facing temptations and controversies, are making inroads into an art world void of meaning. The Bob Jones University Museum & Gallery houses one of the largest and most important collections of Old Masters' religious art in America. Thirty galleries displaying Italian, Spanish, French, English, Flemish, Dutch, and German sacred art from the 13th through the 19th centuries. More than 400 works are displayed by major artists such as Rubens, Van Dyck, Reni, Tintoretto, Veronese, Le Brun, Cranach, Ribera, and Murillo. The collection may be enjoyed as a valuable study of the chronology and development of Western Art. Christians in the Visual Arts is an international arts organization seeking to explore and nurture the relationship between the visual arts and faith. With over 1,000 members in 28 countries, CIVA publishes a newsletter and members' directory, sponsors national and regional conferences and has several traveling shows available to institutions for rental. Its membership consists of artists, craftspersons, art historians, theologians, gallery owners, museum directors, churches and college art departments. CIVA publishes a triannual newsletter. Member of the Council of Christian Scholarly Societies (CCSS).